For families looking for a fun family holiday in the sun with plenty of entertainment and activities, Verde Azzuro is the ideal choice. 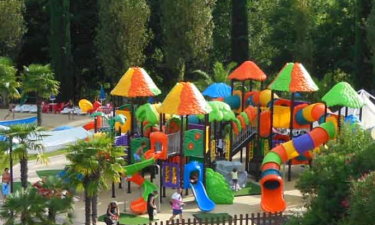 Set within a large forested luxury camping site in the heart of Marche, you can expect daily entertainment and clubs to keep the children happy. For adults, the rolling hills and beautiful countryside colours offer relaxation and peace of mind. 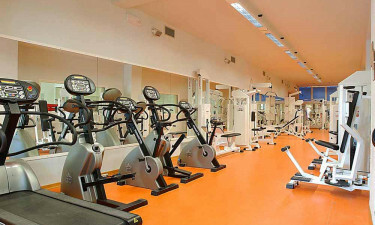 Verde Azzuro is surrounded by hill towns and lush fields. With plenty of walks, wineries and eateries in the area to indulge in, the real draw is the large luxury camping site and its plentiful activities for children. Entertainment is programmed daily and, with well set mobile home accommodation, there is ample opportunity to relax in the Italian sunshine. Book your next camping holiday at Verde Azzuro with LuxCamp. Children's clubs for all ages. Evening entertainment for families and adults. Bicycle rental and green pathways. For guests, there is a semi-Olympic sized pool on site free of charge in addition to hydro-massage pools and a paddling area, copious sun beds and a nearby bar. With morning exercises in the water, there is something to keep the whole family entertained. 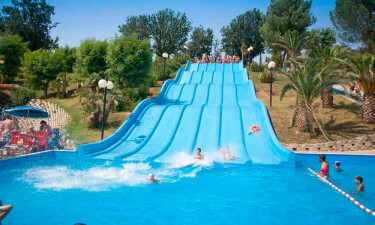 There is also a water park accessible for a reduced fee on site, with everything children could want. Kids will enjoy the many slides, lagoons, "canyon" river rapids and games in this large poolside area. Adults can enjoy sunbathing knowing lifeguards are on duty.